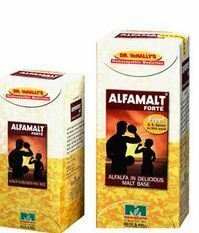 Alfamalt® Forté is a malt based homoeopathic tonic which influences nutrition, evidenced in "toning up" the appetite and digestion resulting in greatly improved mental and physical vigor, with weight gain. Alfamalt® Forté improves the metabolic process of the body, thereby enhancing the absorption rate. The chief constituents in Alfamalt® Forté ,are therapeutically renowned for their characteristic feature of adding weight to the muscle tissue without adding fat. Alfamalt® Forté can be concomitantly taken with enriched food or cold milk to facilitate the digestion process of the body. It can be regularly administered to provide overall good health. Align="justify">it is a small sapling that grows to become a big tree. This is true of medisynth as well. From a clinic in mumbai, medisynth grew to become one of the leading manufacturers of homeopathic medicines in the country. Align="justify">the medisynth group is a self contained group, something that is unique in the homeopathic industry. It is also among the few to maintain global standards of manufacturing in the industry. Under the auspices of Dr sharad vaknalli and dr jayant vaknalli, the group has achieved tremendous success and has carved a niche for itself as the leading manufacturers of homoeopathic products. Align="justify" medicines collaboration with beck & koll laboratories provided the medisynth group with the foothold that the group has maintained admirably even today. Infact, by constantly innovating and introducing newer variations, medisynth always stays one step ahead of the rest. As part of the groups csr activities, medisynth holds and sponsors seminars that help in furthering the cause and interests of homeopathy and in reaching out to a large number of people.